Unfortunately this pistol has been discontinued. To see our full spring pistol range click here. 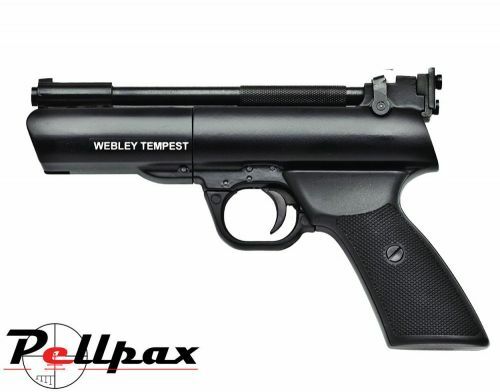 The Tempest from Webley is a classic over lever design spring powered air pistol which is now coming to the end of its manufacturer with this latest batch of 800 all emblazoned with 'Finale' next to the Webley Tempest name to mark this iconic end. The pistol has a rifled steel barrel and the spring and piston design pushes the pellets out of the barrel with approximately 3.1 ft/lbs of energy making it perfect for close range pest control or casual 10 meter target shooting. The barrel is secured in place with the classic Webley barrel locking lever and a manual safety helps prevent accidental discharge once the pistol is cocked and loaded. The 2 stage trigger has a crisp and clean release on each shot for a great shooting experience. The polymer grip is ergonomically shaped for comfort when shooting and the open sights ensure you can be on target as soon as you receive it.